Turn leftover cardboard into a creative adventure with this construction kit. The holiday gifts are all unwrapped, and the kids are playing with the empty cardboard boxes. 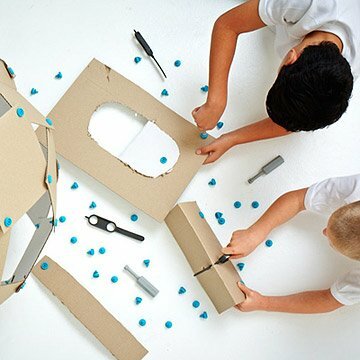 Turn those accidental toys into a creative adventure with this cardboard construction tool kit. It includes a Safe-saw for cutting cardboard (but not cutting little fingers), 28 reusable plastic "Scrus" for fastening cardboard pieces together, and a Scru-Driver to install the fasteners. With these simple tools and a little imagination, kids can create creatures, vehicles, armor, and other small constructions from the corrugated cardboard that tends to pile up around the house. For one or two makers, ages 6+ (4+ with adult supervision). Made in China. The grandkids really enjoy this product. I absolutely love the idea behind this and I really hope that my brother gives it a try with his two sons, but I'm worried that there isn't enough guidance to create a jumping off point. The bag is easily overlooked, especially when the kids are surrounded by high tech toys and things. Personally, I would have preferred if this product came in two styles: the first, much like it is currently, sold as the add-on pack (containing more tools and hardware), but the other being a starter pack. Ideally, this starter pack would include what it currently does, but also some diagrams and plans for starter projects (and grandiose ones! ), some colorful sheets of cardboard to act as accent pieces for whatever crazy plans are in there, and, most importantly, a large and striking box with an image of some thing or things created using the kit (and the bonus here is that the box itself could be used in some of the building plans, even possibly having outlines and instructions printed on the inside). The biggest downfall of this product as it is, is that there is no reference for what kind of thing it can produce! My nephews love box forts, but my saying that this can help them build a super cool one doesn't have an impact when all they see is a tiny bag, and sadly, I don't live close enough to them to help them assemble something. So, I really, really hope that my brother investigates this gift and tries it out with his sons so that they can fall in love with it, because I really do love the concept of this item! Building with boxes when we can't go outside. We love these! I only first heard about these last month. My young son loves boxes and tape!! This offers a great solution and no more running out of tape! I love that these are reusable.They are fairly easy to use ( although I did have to help with thicker cardboard pieces) It promotes creativity and imagination! The possibilities are endless. I had just as much fun ( if not more) helping my son build an awesome fort Christmas morning. I would definitely recommend these! Keeps my grandson occupied for hours! This was a total find. Our daughter loves to create and craft. A future maker through and through. She won't let anyone throw out boxes because she can see what they will become. From dollhouses to trains to full on homes/forts she loves to dream about use cases scenarios for corrugated! This tool was perfect for her arsenal, looking forward to what she comes up with. Exciting future gift for granddaughter! Such a fun and unique gift! At first my kids (2 girls ages 6 and 8) were not interested in the kit. I had to explain its use and show them how to use the cutting tool and screws. Shortly thereafter they were hooked! It has been 8 months and they continue to work on their tree house! I can't believe how much time they spend working on it together- with no fighting. They make plans, expand their ideas, problem solve and work together. I really think this is the best toy they've had. I plan to purchase additional sets because they just told me they are running low on screws. I highly trecommend commend this toy! !